Pennsylvania Gov. Tom Corbett said at a press conference Monday that he is "confident" a suspected killer of a state trooper will be caught soon. Eric Frein has been the subject of an intensive 10-day manhunt after being accused of setting an ambush late on Sept. 12 at barracks for Pennsylvania state troopers in the rural Pocono Mountains that left one dead and another wounded. Frein escaped after the attack, and Corbett said he is "out in those woods right now" relatively near the site of the ambush. State police Lt. Col. George Bivens, deputy commissioner of operations, said the search area for Frein has been narrowed down as they follow up on numerous reports of sightings. Frein has been described as a self-taught survivalist who planned the attack and his subsequent escape for a long time. Bivens said Sunday that Frein had covered perhaps 15 to 20 miles on foot since the shooting. He asked residents to report any shelters or bunkers that Frein may have constructed and also asked hunters to review footage from trail cameras set up to track wildlife. Authorities do not believe he has contacted his family and have no information that he has been helped by anyone, Bivens said. Gov. Corbett also said officials believe Frein targeted only law enforcement because "he had an opportunity to shoot civilians" but only took aim at officers. On Sunday, Bivens said police engaged in the search for him have found items that he may have been intending to use including an AK47, an automatic weapon magazine, and ammunition. "Based on our investigation, we know Frein has prepared and planned extensively for months or maybe years," said Bivens. "He planned his attack and his retreat -- however, we believe we are closing in on him." Though a shelter-in-place order had been lifted in the Pocono Mountains community where police have focused their search, they continued to urge residents to be vigilant Sunday as the manhunt continued for Frein. 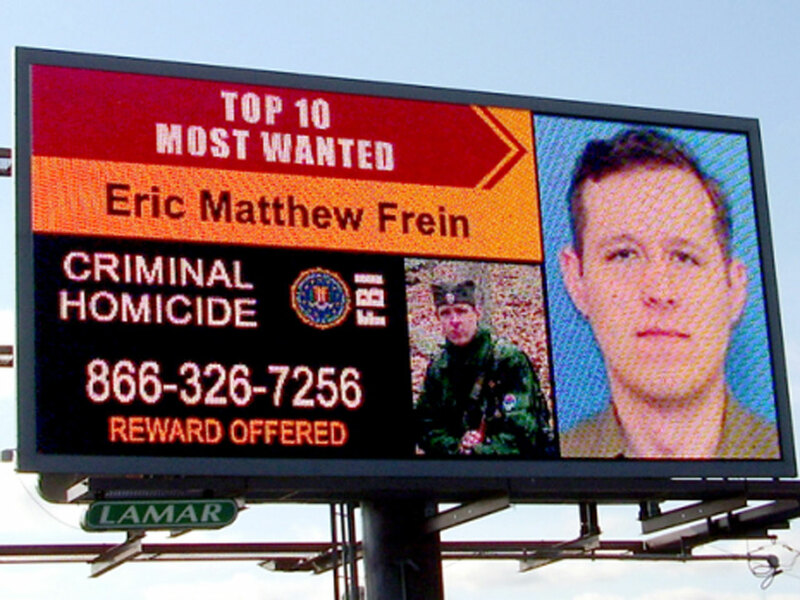 A state police spokesman said late Sunday no contact had been made with Frein, who was placed on the FBI's Most Wanted list after the Sept. 12 shooting. Authorities say Frein used a high-powered rifle to kill Cpl. Bryon Dickson - a married ex-Marine with two sons - and wound Trooper Alex Douglass outside the barracks in Blooming Grove. Though police described Frein as a survivalist with a grudge against police, some who know him said he has not always played the loner. Frein joined a group that performed military re-enactments of Eastern European conflicts in the modern era and played a small role in a 2007 movie about a concentration camp survivor - earning him a mention in the movie database IMDb. He also helped with props and historical references on a documentary about World War I. "He was a very friendly guy to me," said Jeremy Hornbaker, who hired him for the documentary. "We left on very good terms." Frein's father, retired Army Maj. E. Michael Frein, told police that he had taught his son to shoot. He "doesn't miss," the father told state police during a search of the family home, when he also disclosed that an AK-47 and a .308 rifle with a scope were missing. A copy of the book, "Sniper Training and Employment," was found in his bedroom. Frein's only known legal problems stemmed from the 2004 theft of some vendor items at a World War II re-enactment in Odessa, New York. He failed to show for his trial, and was arrested in Pennsylvania as a fugitive from justice. The FBI's Most Wanted poster describes him as 6-foot-1, 165 pounds. State police said he apparently cut his hair into a wide Mohawk in preparation for the attack. He was also described as a heavy smoker.